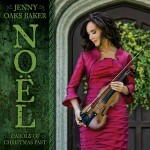 Grammy-nominated violinist Jenny Oaks Baker captured the historic sound of Christmas on her latest album, Noel: Carols of Christmas past. The album features songs produced and arranged by Emmy-award-winning composer Kurt Bestor. Two songs on the album also featured Kitka, an Eastern European-style vocal group based in California. An interesting feature of Noel is the unique array of instruments that were used. Kurt Bestor went to great lengths to track down and use ancient instruments from many countries, like the lute, dulcimer, Kora, and ney flute. Behind-the-scenes video of her latest album Noel!